Enter Mayfield through the three hectare natural woodlands entrance, past eucalyptus, English oak and native healthy woodlands and know you have arrived in a very special place. Along with preserving this tract of bushland, native vegetation will feature strongly throughout Mayfield with inspiration drawn from the adjacent Royal Botanic Gardens. Cranbourne’s Royal Botanic Gardens are made up of 360 hectares of garden and open space including walking trails, picnic and barbecue areas, a visitor centre and café. Green thumbs will also enjoy attending their horticulture events and information sessions held throughout the year. Mayfield has recently opened its brand new Children’s Nature Garden which is nestled within the three hectare natural woodland reserve and forms the natural entry to the community. It is home to a range of interactive play equipment specifically designed to engage with children and encourage sensory and natural play. The hub of the play space is formed by a bird’s nest climbing structure which is centred around an old oak tree, kids can be brave and ride down the fireman’s pole, slide down the slide or swing between the monkey bars. Explore the garden by following the sensory walk that weaves in and out of the native plants and fauna, take in and admire the sculptural elements or become an explorer and hop between the balance beams and dig your way through the sand pit. Complete with a BBQ area, picnic tables and shelter and free public WiFi, Mayfield’s Children’s Nature Garden is the perfect destination that can be enjoyed by all the family. Move to Mayfield and know what it’s like to engage in a truly active lifestyle. Everything sports and outdoors is well catered for at Mayfield. 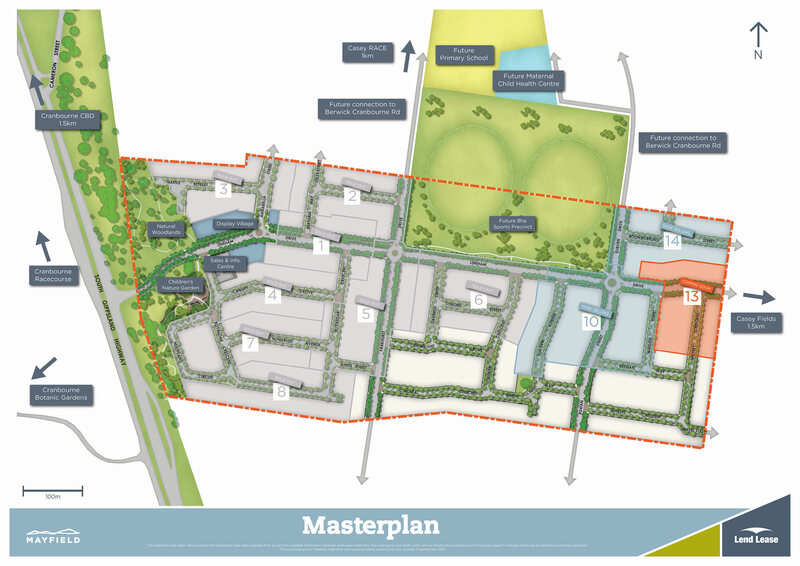 As well as future plans to develop an eight hectare sports precinct that will include two AFL sized sports ovals, cricket nets, netball courts, a sports pavilion and other community facilities, Mayfield is serviced by a number or pre-existing centres within minutes of the community. The Casey Fields Regional Athletics Centre is located just a short walk away, offering a broad range of activities, including football ovals, tennis and netball courts, cycling, regional athletics and playgrounds. The Casey RACE Aquatic Centre is also nearby, it features lap pools, water play zones, exercise pools, childcare, fitness centre and café, a perfect spot for catching up with new friends. Located opposite Mayfield is the well renowned Cranbourne Race Track, which has superb member and public facilities so you can easily enjoy a day at the races.